Early reports on the 2001 Perseids meteor shower indicate that it was OK but not great. Only a few reports have been received; so far, North Americas are reporting a good number of long overdense burns but nothing spectacular. However, first reports from both sides of the Atlantic indicate that the stations using FSK441 made many contacts. Reports of numerous contacts (48 for one European, 31 for one American), new grids worked (28 for one American), and new DXCC countries (9) have been common. Because of the scarcity of reports, others probably have done better. Because of the moonlight, the visual reports have been few. Rates seem to have been about average (within the uncertainty caused by clouds and moonlight). Several observers have reported more bright meteors than in the past few Perseid showers. Watch the October and November issues of QST and CQ for reports. (The October CQ will feature WSJT as the lead in the VHF+ column). Who was Perseus? Learn more about this popular meteor shower, and also the mythology behind it! Read about the Perseids. How do HSCW and Hellschreiber compare? Tests over a known path are currently in progress, so the following is a very prelimary report. A full report by K1JT et al will be written after more tests have been run. speed, sensitivity, and overall usability. Speed - 5x or 9x MS Hellschreiber is 4 to 20 times slower than HSCW, as currently used. Thus, while faster than SSB, it is much slower than HSCW. This limits its usefullness on 144 MHz, though it can be used during above-average conditions. Because much of the transmit period is sending "white" (key up), the average power output is no more than abut 20% of peak. This means that very few of the short and weak pings (which might contain a few characters in HSCW) can be used or even detected. However, on 50 MHz, with the longer pings, it is often usable. Sensitivity - 5x, and probably 9x, are sensitive, possibly as sensitive as HSCW. The 10x duplo mode does seem to be usable for MS work, tho not as sensitive as 5x and 9x. Overall usability - The IZ8BLY program is almost as easy to use as WinMSDSP. Insufficient tests have been run at this time to discuss the comparisons any further. It appears that 9x Hellschreiber is nearly as good as low-speed (~1000 lpm) HSCW on 50 MHz. On 144, it works, but is so slow as to make contacts much more difficult. It is superior to SSB on both bands. It is not certain how much more the Feldhell speeds can be increased. Watch for a full report after more tests have been run. Ilkka, OH5IY, has made some changes in his popular MS-Soft meteor scatter program (used by all serious MS operators). It corrects a couple of problems, and has an extensive text (html) file concerning the history, physics, operating procedures, etc, of meteor scatter. VM-Soft V. 4.4 for visual work. These are available at http://www.sci.fi/~oh5iy. Listen to MS pings - without turning on your receiver! Moe Wheatley, AE4JY (Cf. Jan 2001 QST, p. 35), has already released the second version of his Meteor Scatter Simulation Program. The pings sound EXACTLY like the real thing! (Little underdense pings only). You can adjust the number of pings per minute, their S/N ratio, strength, length, speed, and the text; some of these settings can be randomized. Set it for "straight-key-speed" CW, or HSCW too fast to be usable even with MSDSP! The output of the program can be played thru your speaker or saved as a wave file. (The wave file will need some editing and other changes in Cool Edit before playing back in MSDSP, but then you can slow it down and copy the text just as you would on a schedule). In fact, the only way that you can tell that the pings are artificial is that they are all the same shape (a "classical" underdense ping shape). Even more amazing, Moe does not work MS! This may prove to be a valuable tool for testing HSCW speeds vs. S/N ratio, etc. Try it. You'll be amazed! WAVE files of pings of all kinds, but most short and weak, have been uploaded. Some have a very short, weak, little ping enbedded in the surrounding white noise so that you can see how it might sound during actual reception. Some will be a challenge to copy. They are primarily for testing WinMSDSP (or equivalent programs or equipment). These are not great, spectacular overdense bursts, but rather most are typical pings from a "poor day" sked. Note, however, that they will be of no value unless you already have MSDSP ready to set up. Read about them at the bottom section of the Sounds and Sights page. Also, a new example of flutter-type QSB, plus 3 with a little Doppler shift on them. A brief summary of the military, commercial, and Amateur uses of meteor burst communications has been written by Sascha Segan for ABCNEWS.COM. While short and with only a couple of lines about Amateur work, Sascha has done his homework and it has a good background on commercial and military uses. You can find it on ABCNEWS.COM's Web site. Worth reading. (If you're interested in learning more about the history of MS, and also some theory behind meteor burst communications, see the several text files bundled with OH5IY's MS-Soft program. Rates start rising around Nov 17, 2200 UTC, and reach values above 200 from about Nov 18, 0130 UTC onward. ZHRs continue to rise until they almost reach the value of 300 around Nov 18, 0345 +/- 15m UTC. Afterwards, the rates drop again. Towards the end of the European observing window, rates no longer fall and tend to increase again. This increase is matched with the start of the American observing window which starts with a steady increase in rates reaching the value of 300 already around Nov 18, 0530 UTC. Rates continue to rise to a level of 450 around Nov 18, 0715 +/- 15m UTC. More information available at a lot of Web sites. Try http://science.nasa.gov/headlines/y2000/ast21nov_1.htm?list133415 for a start. (To see a very interesting graph on this from the Ondrejov backscatter radar, go to http://www.asu.cas.cz/~koten/radar.html). Radio data and QSO lists from Europe correlate well with the visual data. However, in North America, there has been little information that a shower even was noticed by the Hams! Reports so far have been few, and contacts fewer. Little activity was reported on 144.200, yet the Leonid peak apparently was considerably better than the Geminids or Perseids usually are. It has been suggested by several that the primary problem was a lack of activity. This may have been partly caused by the ARRL EME Contest, which was going on at the same time (and with several very rare countries available). However, most North American EME stations do not also work MS, so the EME Contest should not have made that much difference. It appears that too many people simply were not willing to be on during the middle of the night when there was no assurance of a meteor storm! PROSPECTS FOR NEXT YEAR: There are again predictions for multiple Leonid peaks in 2001, with probable storms. During November 18 and 19, the Earth is predicted to interact with several different trails of dust ejected by Comet Tempel-Tuttle from the years 1666, 1699, 1799 and 1833. Highest activity is expected over eastern Asia and Australia soon after 1800 UTC on November 18, where some forecasts are suggesting rates of up to 15,000/hr! For North America, the one encounter that seems to yield the greatest promise for high activity is the 7-revolution dust trail (shed in 1767). There are three specific predictions for this trail that have been published . . . all of which are very close in both the predicted peak times and predicted hourly rates. The time of this peak is approximately November 18, 1000 UTC. To see the predicted times and rates, possibilities for 2001 and 2002, plus lots more background information, go to the Leonids 2000 page (and also follow the links). NOTE - the information concerning the possible peaks for the next two years will be updated with more details on these pages as soon as possible. Please check back. Other Leonid information has been moved to several pages of its own. Go to Leonids 2000 and follow the links. NEW OPERATORS - remember that there is a large number of papers, many necessary, on both the W8WN Web site and the W6/PAØZN Main NA HSCW Web Site. For this Web site, go to the W8WN HSCW Home Page (or, if you just came from there, go BACK to it so that the frame display will be correct). Then look under PAPERS, ANTENNAS, MSDSP, and/or PROPAGATION, etc, to find them. The really necessary paper for U.S and Canadian Hams is the North American "Procedures" ("HSCW-SOP"). Also needed are the "Operating Chart," "Semi-Technical FAQ," and whatever others you need to fill in the gaps. To keep up with happings on HSCW (and also MS in general), it is strongly suggested that you join the HSCW Reflector (primarily North America) and the meteor-scatter Reflector (primarily Europe, though much overlap now on both). These are where most HSCW announcements and skeds take place, as you will not find much HSCW discussion on the general weak-signal VHF reflectors (and very little concerning anything on MS, except during the handful of major showers. At this time the WSVHF Reflector becomes quite heavy with schedule requests, etc). To join the HSCW Reflector, send a message to [email protected] with the text, subscribe hsms. To join the meteor-scatter reflector, send a message to [email protected] with the text, subscribe meteor-scatter. To join the WSVHF Reflector, send a message to [email protected] with the text, subscribe wsvhf. And, of course, check out the Ping Jockey, "Hot Rocks" and European MS real-time MS Web sites (and also the several other real-time VHF propagation sites linked from there). (Most North American non-MS propagation notes, etc, seem to be on the WSVHF Reflector, another of the qth.net reflectors). North American HSCW Ops - be sure to Register so that we know you're there! Go to the NA List Directory and sign in! Both NA and European ops, sign in on the World Wide listing, available from the "Make More Miles on VHF" Web site. Some more non-MS notes: Since the Space Age dawned in 1957 with the launch of Sputnik, 26,643 artificial objects -- from rocket parts to the International Space Station -- have gone into orbit around Earth. So far, 17,681 of those have come back down. Not one person has been hit or hurt. When Skylab fell on Australia in 1979, the only damage was to NASA's budget. It got a ticket for littering from an Australian city council. There's a "new star" in the sky - the International Space Station. With the deployment of the large solar-cell "wings" on the ISS and the Destiny module, it may now be one of the brightest stars in the sky when the sun angle is right. To determine the brief times when either the ISS or an Iridium flash is visible from your location, try http://www.heavens-above.com/ which, after you've entered your latitude and longitude, can give you exact timings for your location. (AMSAT, Celestial, others have Keps for your tracking programs - the "Heavens Above" site has become a favorite for those trying to visually spot one of the satellites. Give it a try). NASA has just released some neat sounds from Jupiter, as recorded by the Casini spacecraft. The signals (low radio frequencies, which have been converted to sound waves) apparently are from ion-acoustic waves, which result from electrons moving in non-random patterns driven by a flow of energy. In this case, the energy flow probably comes from the heat of Jupiter's bow shock. Worth taking time to download and hearing some other-worldy 'sferics! Plays for 23 seconds; 623 K. Go to http://www.jpl.nasa.gov/cassini/acoustic. You may even want to save the file to amuse your friends (would also do well at Halloween). Information on the first ARISS contact between the International Space Station and a school can be found at http://science.nasa.gov/headlines/y2001/ast30jan_1.htm?list133415. For ARISS information and updates, visit the ARISS Web site. Here is Clint's final report of his 144 MHz HSCW MS operation from this trip. (He also operated some 144 MHz and 10 GHZ tropo scatter operation plus some 50 MHz SSB MS, but we have no information on his contacts on these bands and modes). See new photo of his ship, in the shipyard. Look to the right of the stack, you may be able to see his antennas (150 K). Hear portion of overdense burst on W4WHN, EL96, as received by W1LP/MM, EK30, in the Pacific. (0.8 sec, WAVE file, 36 K, so will take a while to download. Or, in MP3 file, 15 K. 6000 LPM, FB sig! Full speed - you'll have to copy it yourself, as the file would be too big at an easy speed of 25 wpm). "Here is a list of stations and the grids I worked them from over the past 5 weeks via 2M HSCW from the Paciific, Caribean, Gulf of Mexico, and East Coast. About 2/3 of the contacts are from calling CQ. The other 1/3 were made during skeds. My ship is now in the shipyard in Houston where it will be until late January. I'll be going home in late Novenmber and will return to the ship in March 2001. The annual Perseids activity was interrupted Saturday morning (August 12) by a big aurora! Reports indicate that it was seen/heard as far south as LA. (VE3AX was heard working W5RCI, Marks, MI). Because of operators getting up early for MS skeds, the activity was high for that time of day. The Europeans indicated that their radio aurora disappeared about 0800 Z, followed by a brief period of auroral-E. There was some auroral-E reported from the central or western part of North America, also. Several reports tell of great visual auroral displays across the northern Midwest states, and Rocky Mountain operators reported hearing East Coast stations. One Amateur had a broad auroral curtain with a number of meteors streaking past. An interesting morning! For more, see notes from the NASA Science News (has some great pictures). (Notes on the April 6 Aurora and July 15 aurora can still be found on the Archive page). A few reports, primarily from North America, indicate that the Perseids meteor shower this year was not exceptional; but a few other reports, especially from Europe, seem to describe a "normal" shower for the "old standard" Perseids. Both visual and radio reports tell of a fair number of very long, strong burns. There are reports of a large number of quickly-completed contacts, some using only low power. The peak times for this year's Perseids were predicted to be about 0500 Z for the early peak and 1000 Z for the main peak. Europeans report a sharp, early peak at about 0530 Z and a normal, broad peak about 1000 Z. However, first visual reports to the IMO indicate that there was no early peak seen. This is the first time in the 10 years since the return of the parent comet that the early peak failed to appear (if, in fact, it actually was not present - first visual reports are sparse at the expected time of the early peak). Very little had been expected from the early peak this year, as it had been decreasing in strength the past few years. The best pings and bursts were noted here (central KY) between about 1400 and 1530 Z. Was the peak really a little late, or was the aurora to blame for this? Or perhaps there were just a few little filaments giving some extra enhancement at that time? There was no random MS activity heard during most of the aurora, as everybody was busy with it. Routine schedules continued, however. When did you experience the second (main) peak? Two noteworthy MS contacts was made over a distance greater than 1400 miles (2250 km); one of these may be a new North American HSCW DX record on 144 MHz (we now have at least 3 recent HSCW contacts within a few miles of the same distance, depending somewhat on the accuracy of the coordinates of each station). WØAH had two "near misses" on SSB over 1400 miles. There apparently were a number of other contacts at longer than average distances. (Anything beyond 1400 miles via MS is exceptional, and would have been considered nearly impossible in the past. Several 222 MHz contacts were completed this year, often very quickly! We have heard of several 432 MHz schedules on the 13th, but no contacts have been reported. See the link on the next item (and bookmark it - it's very good! ), as well as links near the bottom of this page, for more information on the shower and aurora. Old Sol does it again! The most intense geomagnetic, auroral and solar radiation storm of solar cycle 23 brought the largest auroral storm since the March 1989 event, surpassing the April 2000 aurora. July 15 produced contacts at least as far south as central Texas, Mississippi, and Georgia. N4IS, EL96, southern Florida, reported hearing some weak auroral signals, but was unable to work anyone. A number of stations are reporting 50-70 QSO's in 40 to 50 grids all the way from the East Coast to the Rocky Mountains! This was an extremely powerful geomagnetic storm. On the 15th, the panetary A index reached 152 and the mid-latitude A index was 148. The planetary K index reached 9 for at least a 9-hour period! This was one of those extremely rare events that happens only a few times each sunspot cycle. At least one satellite, the Japanese ASCA X-ray observatory, is in serious trouble because of the solar storm. For animations of the CME, as recorded by the Solar and Heliospheric Observator, go to http://sohowww.nasacom.nasa.gov/data/CME/. (Also, the June, 1968 issue of Sky and Telescope had a map which shows how far south the aurora may be visible, dpending on the planetary K index. It can be found at http://www.sec.noaa.gov/info/kp-aurora.html). For a brief explanation of these parameters, see K7VVV's summary. N6CL, CQ's VHF Editor, will have a sidebar in the September issue of CQ and a more extensive report in the October issue. No doubt W3EP will do likewise in QST. K9KNW/MM. Click on photo for enlargement. 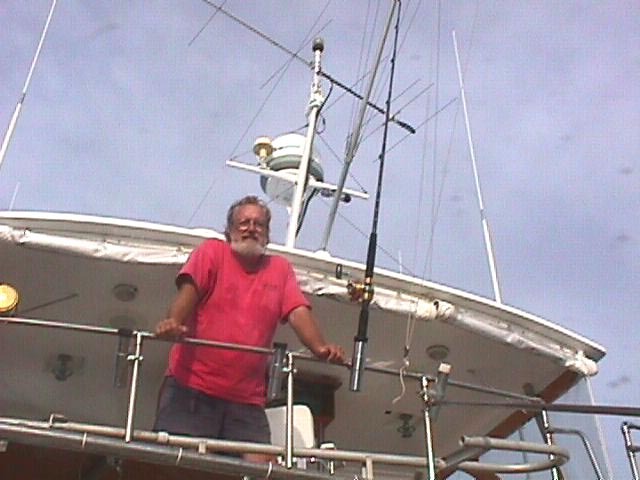 K9KNW/MM is now back home after a couple of weeks of island-hopping in the Bahamas, while making some very rare grids available to those within the 600-1250 mile range of his low antenna. The biggest disappointment, other than the fact that not all of us worked K9KNW from every grid, was the small number of operators who attempted to take advantage of this rare opportunity. On many mornings Joe had open schedule times with no takers. The possibility of this grid-hopping voyage was announced some time ago, and a number of messages were posted on the various VHF reflectors in the early part of the trip. Sorry, that's the best we could do. Joe reports that he has a lot of work to do on his boat. This trip was not primarily for Amateur Radio operations, in spite of his successes with HSCW MS. But he is already thinking about another trip! In fact, the next trip might be exclusively for Amateur Radio operation! No details are available at this time, but any announcements will be posted here. If you are in MS range of his probable itinerary, now is the time to get HSCW operational! Thanks, Joe, for all of your work to give some of us a whole batch of very rare grids! And thanks to Dean, W4WHN, for all of your relays. Additional note - Brad, W9FX, has written up a short account of the voyage. It has been submitted to QST for possible inclusion as a side-bar for the full-length HSCW article, tentatively scheduled for the October or November issue. FL15 - WB5APD, W5SNX, W8WN. FL14 - WB5APD, W5SNX, W8WN, K2TXB. Also some SSB tropo to the mainland (and heard weakly as far away as EM73 on tropo). FL13 - K2TXB, W5SNX, WB5APD, W8WN. FL23 - WB5APD, K2TXB, W8WN, W9FX, W5SNX, W4WSR, K1JT. 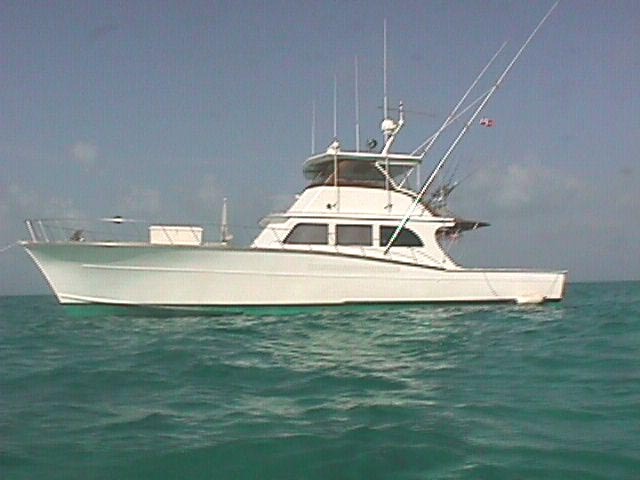 FL24 - W8WN, WB5APD, W5SNX, K2TXB, W4WSR, W9FX. (Also some 50 MHz Es). K9KNW/MM went fishing over the Labor Day weekend. While in EL85, he was caught on HSCW by a number of fellows for another new all-water grid. Thanks, Joe (and thanks, Dean, for setting up the skeds). The April 6 AURORA was the largest of the current sunspot cycle, and probably the largest in the past 10 years. The peak of this sunspot cycle is predicted for this summer. While it is not expected to be quite as high as the last two, we should see a number of auroras, 50 MHz F2 openings, and other "goodies" that VHF operators look forward to! However, remember that the solar activity that produces the good effects can also produce some detrimental events. Several satellites were damaged by radiation during the last peak, and LEO satellites had their orbits pushed closer to the earth resulting in the premature re-entry of several. And don't forget the Hydro Quebec power outage in March 1989, where power was lost to more than 6 million people! Since then, steps have been taken to harden satellite electronics and to protect the power grids. But don't sell all those Y2K supplies too early! We rely even more on these highly technical gizmos than we did in 1989, and Old Sol could throw us another damaging blast! Description, with a lot of photographs. NASA Science News has collected about 40 images of the aurora. Go to today's NASA News page for a look. NOTE - if the link from the above page to the "gallery" is not working, you can still see the pictures (some are spectacular!) by clicking on the individual picture numbers in the table describing them. The three-year series of 144 MHz HSCW MS schedules between W8WN (EM77bq) and KØXP / KOØU (FN42dg) has ended for now due to KØXP's move. The schedules began in May, 1997, at 250-400 lpm (50-80 wpm), receiving by ear and transmitting with a programmable keyer or OH5IY's "MSSoft" program. DL3JIN's "SBMS" HSCW receiving program was discovered, and it was immediately put into use. In July 1997 9A4GL released his first beta (receive only) version of "MSDSP". This was followed by a number of other versions, which soon also had transmit capability. By the end of 1997, contacts had been completed at speeds up to 8500 lpm (1700 wpm). Other North American stations were becoming interested in HSCW. Several were using "CoolEdit", but most were using MSDSP. (HSCW had been attempted a few times previously in North America, but few if any contacts were ever made due to the lack of activity. It's hard to complete a contact when there's nobody available on the other end!) It quickly became obvious that the procedures in use for SSB and slow-CW MS were inadequate for HSCW MS operation. However, even though HSCW MS was in its infancy in North America, routine schedule speeds were already higher than those in use in Europe. So W8WN and KOØU, among others, began experimenting with HSCW procedures, attempting to preserve as much of the structure and format of the Western Hemisphere's 40-year-old traditions, but also taking the best of the European HSCW methods. Ideas were then discussed, sometimes at length, among the active HSCW stations. Eventually, a set of North American procedures fell into place (found in Procedures). For the first two years, however, most of the schedule time was taken up testing various versions of 9A4GL's DOS versions of MSDSP. Tihomir spent a lot of time working on the program, and he was always receptive to our comments, ideas, and requests. (He eventually put in almost everything we requested!) But this was a difficult program, and it required many versions before it became stable enough for reliable operation. Each version had to be tested in as many ways as possible, looking for bugs that had slipped in while correcting other problems. W8WN and KOØU were two of the dozen or so Beta testers for all versions of MSDSP, so testing the various versions was the most important work for much of this three-year period. Because of the tests of MSDSP, tests of the limits of unmodified equipment capabilities, tests of new procedures, and general checks on MS conditions day by day, no great effort was made to actually complete each contact, though normal procedures were usually followed. The schedules usually ran 5 days per week, depending upon the availability of both operators. Normal sked length was 15-20 minutes, due to other committments, but with a few running as much as 30 minutes. (It was not unusual to complete a contact in 4 to 10 minutes on a good day, but 15 minutes was the nominal schedule length). Here is a brief summary of the schedules. (Numbers may not be exact, but are very close). When one station was on but the other was not able to be there, for this summary it was not counted as an attempt. May-June 1997, 250-400 lpm (50-80 wpm). 40 skeds, 2 complete. 5% completion rate. Receiving by ear; later by SBMS. July-October 1997, 500-2000 lpm (100-400 wpm). 60 skeds, 2 complete. 3% completion rate. First versions of DOS MSDSP. First, receive only. Later, receive and transmit using MSDSP. November-December 1997, up to 8500 lpm (1700 wpm). 40 skeds, 21 complete. 52% completion rate. Testing many versions of MSDSP. Testing procedures. Testing equipment settings. December 27, WD8KVD and KOØU set record at 8600 lpm (1720 wpm). See article about WD8KVD for more. January-December 1998, 2000 to 16,500 lpm (400-3300 wpm). 208 skeds, 129 complete. 62% completion rate. Many different speeds tested. "Soft keying" problem, loss of S/N ratio at speeds above 10,000 lpm noted. December 25, WD8KVD and KOØU set record at 16,600 lpm (3320 wpm). January 1999-April 2000, 2000-15,000 lpm (400-3000 wpm), most 6000-10,000 lpm. 215 skeds, 172 complete. 80% completion rate. February, 7 consecutive completions (in poor time of year for sporadics). KOØU's call changed to KØXP. First (beta) version of Windows WinMSDSP 2000 used on air for first time. August thru November, 61 of 65 skeds completed (94%). 10,000 lpm now being used regularly. And even this is too slow for the huge number of very short, weak pings usually received! No great discoveries were made. But a number of things that were generally "known" but never completely realized suddenly became clear. Most non-shower pings are underdense, and last only a fraction of a second. Pings of one-second length or greater are very rare on 144 MHz outside of showers. However, occasionally a 5-second to 30-second overdense burst will pop in! Nearly all overdense bursts have extreme flutter-type QSB. (This was generally known; but when a burst is displayed on the screen, what is happening becomes much more obvious). Even 10,000 lpm (2000 wpm) isn't fast enough for many of the very short pings. Above about 10,000 lpm, the signal-to-noise ratio becomes poorer. Above about 10,000-12,000 lpm, the keying sounds "soft." This effect is somewhat variable and needs more experimentation (see the Archive Page for more). Since HSCW relies only on the scattering from underdense pings, high power is a definite advantage. The poorest time of year for MS is early spring. But even then, HSCW QSO's are possible every morning of the year! A station running 160 watts to a 16-element Yagi, with a good location, should be able to complete HSCW contacts in the 600-1200 mile (1000-2000 km) range daily. MS conditions change radically and quickly. Not just day to day. But even within a 5-minute period the number may change greatly! It was not unusual for a day that produced 3 or 4 S1 pings to be followed by a day with 15 S1 and 15 S2 pings! Doppler shift was seldom observed. But if one ping had Doppler shift, one or two more with Doppler that same schedule would not be unusual. Pings so weak that they can hardly be detected will often contain some useful information! Even some operators not proficient on CW became very proficient on HSCW (usually using CoolEdit). (Current versions of WinMSDSP have a similar feature, plus an advanced "decode" feature. While it works surprisingly well, it's no more than 10% as efficient as the ear). At distances of 800 miles (1300 km) or less, being able to elevate the antenna can help considerably (see chart under the "Papers" section). Offsetting in azimuth has been problematic. Some days it did not help, other days it helped a lot. Reason unknown. Always listen 5 minutes after ending a contact for tail-ending stations. W1FIG and K1JT often called in and were worked. If you don't know the procedures well, you probably won't complete the contact. There are many pings, but weak and very short, available nearly every morning. And a few pings every evening. Of the approximately 215 completed HSCW contacts made, it is estimated that approximately 10 could have been completed if SSB had been used. None of these results differ from what had been learned during slow CW schedules with W4AWS, W4ZD and others. However, they go far beyond the results of the previous schedules. More details on many of these subjects can be found under the HSCW / Papers and HSCW / MSDSP sections of this Web site, on the W6/PAØZN Main NA HSCW Web Site, and on several other HSCW Web sites. Other long-term MS schedule series had been run in the past with the late W4AWS and with W4ZD. Because of the nature of HSCW operation, more has been learned from this series than from all of the other schedules combined (and this goes back to 1955). Thanks to Steve, KØXP, for his many, many hours of work, to the other MSDSP Beta Testers, and to the other HSCW ops who assisted with the early North America HSCW tests; and especially to OH5IY, DL3JIN, and 9A4GL who have made the modern style, speeds, and successes of HSCW MS possible. HSCW on 50 MHz? A series of skeds has just been run by K1JT (FN20) and W8WN (EM77). Both were running about 100 watts to 4-element Yagis. In spite of the poor sporadic MS conditions expected this time of year, contacts were completed in 6-12 minutes every time. Compared with the same path on 144 MHz, pings were much weaker and longer on 50 MHz. Instead of fractional-second pings, most were about a second in length. (The actual number of pings was about the same on both bands, with too much day-by-day variation to determine further). The reason for the weaker signals on 6 meters was probably due to the much lower gain of the antennas - on 144 MHz, K1JT runs a single 12-element Yagi while W8WN runs a quad array of 16-element KLM Yagis. K1JT runs about the same power on both bands while W8WN normally runs about 1 Kw on 144. (See the next note for more). WANTED FOR SKEDS - Someone about 600-1000 miles/1000-1600 km distant from EM77 who can transmit (or receive) on both 144 and 50 MHz HSCW at the same time, as several people would like an actual same ping comparison between 144 and 50 MHz. Contact W8WN. More information on the "soft keying" when using MSDSP at speeds higher than 10,000 lpm. It has long been observed that at keying speeds of 10,000 lpm (2000 wpm) or less, signals are normally very easy to read when slowed down. But at 12,000 lpm and higher, copy becomes difficult because it is hard for the ear to separate the elements of the code. In other words, the keying sounds "soft" when slowed down and played back. Yet experimental contacts have been made at speeds up to 16,600 lpm (the maximum speed of the DOS version of MSDSP), even though the signal-to-noise ratio also seems to become poorer at these speeds. The reason for the "soft keying" was not known for sure. But, due to the loss of S/N ratio at the very high speeds, few additional tests had been run. However, as the typical schedule speed has increased to 6000 lpm, and a number of recent schedules have been run at speeds up to 10,000 lpm, interest has increased in going even faster to take advantage of the very shortest pings. At 12,000 lpm, as had previously been observed, keying seemed "soft." Now several more tests have recently been run. The first set of tests consisted of feeding the transmit signal of WinMSDSP from one computer directly into another computer, running either WinMSDSP or the DOS version. Upon playback, the keying remained sharp with no signs of mushy or fuzzy leading edges, even at speeds up to 20,000 lpm (4000 wpm)! The second set of tests consisted of transmitting from one computer and transmitter to a separate receiver and computer, side by side. Different speeds, tone injection frequencies, receive tones, IF Shift settings, etc were tried. At speeds of about 14,000 lpm the keying was slightly softer, but the ringing caused by heterodyning the converted signal was becoming bad. 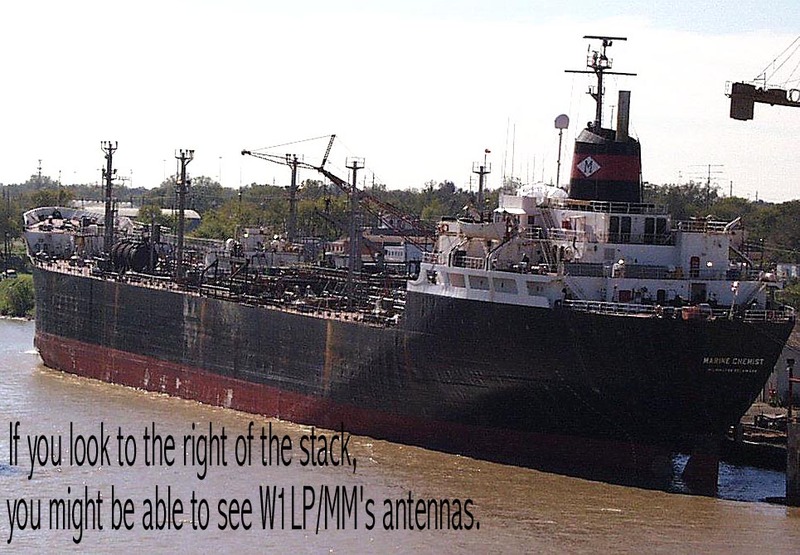 At 20,000 lpm, the signal was unreadable in nearly every test. (These tests have now been run by two different stations using completely different equipment, but with very similar results). 1. Several contacts have been made in the past between 15,000 and 18,600 lpm. The S/N loss and ringing were bigger problems than the soft keying. However, these were all made using the DOS version of MSDSP at each end. (The injected tone was 2500 kHz. SampleRate was probably 44100, tho it might have been 22050). Is there a difference between the DOS and Windows versions of MSDSP here, or was this just "beginners' luck"? (The generated tones are somewhat different). 2. The filters in most modern SSB rigs begin their roll-off at about 2.1 kHz. 4. Besides varying the transmit speed, the injection frequency, the received tone, and the receiver's IF Shift, you should also vary MSDSP's SampleRate setting, the slow-down rate, and whether or not the tone is heterodyned on playback. All of these will interact, giving MANY variables to test! Also, if you have a wider filter available in the transmitter, of course it should be tested. (Note - two rigs operating in NFM or AM mode may utilize broader filters. These are strong-signal modes and not suitable for actual on-air use, but could provide some interesting in-house tests). Please carefully document your changes and results, along with the technical specifications of your rig (both transmitter and receiver) and that of the other station, if a two-station set-up is used, and post them on the HSCW Reflector to help others plan their tests. The information is now in - we have a new North American HSCW distance record. KMØT (EN13vc) and K9KNW (EL95dx) completed an HSCW contact during the Leonids over a distance of about 1434 miles or 2307.764 km. The contact, on 1999 November 18, required an hour, at 6000 lpm. The previous record was 1433 miles or 2306.385 km (K2TXB and NØKQY). These distances were determined using BD and locations measured by GPS receivers. There's only about one km difference! Congratulations to all in working at these distances! 1400 miles has always been the "wall" for MS work in North America, with contacts beyond that distance considered a near impossibility. Now, in the past year, there have been at least 3 contacts beyond this distance, all using HSCW. Who will be the first to work beyond 1500 miles/2400 km? A very inexpensive programmable keyer kit, capable of HSCW operation, is now available. K1EL has recently released his "K10" single-chip semi-kit. Speeds of 5-59 wpm and 1000, 2000, 4000, and 6000 lpm, with provisions for output of a keyed tone (apparently square wave). Cost is very reasonable. Operation is said to be very smooth, and one is currently being used on the air for HSCW. A few additional programming changes are said to be in progress. For more information, go to K1EL's Web site at http://members.aol.com/k1el/ . Some very good questions about MS, operating, and showers have recently been asked not only by people new to MS, but also by some experienced operators. Good explanations are found in the paper MOREON50.TXT, which is part of the OH5IY MS-Soft package, available from his Web site. I strongly suggest that you again read this very interesting paper. Another source is The RSGB VHF/UHF DX Book (available from the ARRL). While not as complete in some areas as the old ARRL VHF Handbooks, it is current, with good MS and HSCW info. (Remember that some of the Region 1 Procedures are the reverse of ours in North America). Necessary for anyone seriously interested in any form of VHF/UHF propagation is Beyond Line of Sight from ARRL. It contains reprints of nearly all the important VHF propagation articles from QST. Other references are listed at the end of the "Semi-Technical FAQ", available on the W6/PA0ZN Web site.